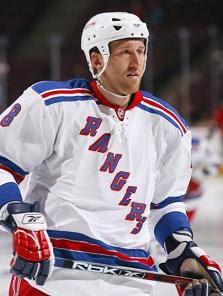 New York Ranger’s defenseman Marek Malik has returned from a November rib injury to realize he has lost his spot as a first pair defenseman. Once Malik was cleared to play he was kept out of the lineup because the defense was “clicking”, but now he’s being kept out because he isn’t the best option. Malik’s position on the team changed when he went down with a rib injury and Marc Staal was switched to the first pair with Michal Rozsival. Suddenly Staal was averaging over 20 minutes of ice time a night and began to thrive. Malik returned and Staal’s ice time went back down, but recently Malik has been getting scratched and Staal has been getting more time. This week Malik was a healthy scratch against the Atlanta Thrashers and New Jersey Devils and Staal played over 20 minutes in each game with Rosival. Malik is likely to see some time on the third pair with either Paul Mara or Jason Strudwick, but this is a bad match up. Malik is a big defenseman which works to his advantage, but is certainly the slowest blue-liner and opposing teams would be able to exploit that further if he were matched up with another big slow defender. The website hockey buzz has the Ranger’s connected to a deal which would send Malik, Petr Prucha, and Wolfpack goalie Al Montoya to Colorado in exchange for John-Michael Liles and Marek Svatos. Although that rumor has not been mentioned by either team’s general managers. Read more NY sports news at Hot Stove New York.